A quick recipe post because I was asked. This recipe is from Judith Cullen’s in A Treasury of New Zealand Baking. (Well worth getting hold of – there’s lots of great recipes) For her version, the cake is accompanied by a spicy plum sauce which I’ve never made because it requires 1kg of plums as well as brandy, cassis and vanilla beans. None of which I ever have in the house. Her cake is also made with fresh plums and up until now I’ve always made it with tinned Doris plums. It’s a batter cake so has a soft, very moist texture. It can be eaten warm with cream, ice cream or yoghurt or cold but it is best eaten day of baking. It does freeze pretty well. ﻿Makes a 26cm round cake but I frequently use a 30 x30 square tin. Prepare tin by greasing and lining. 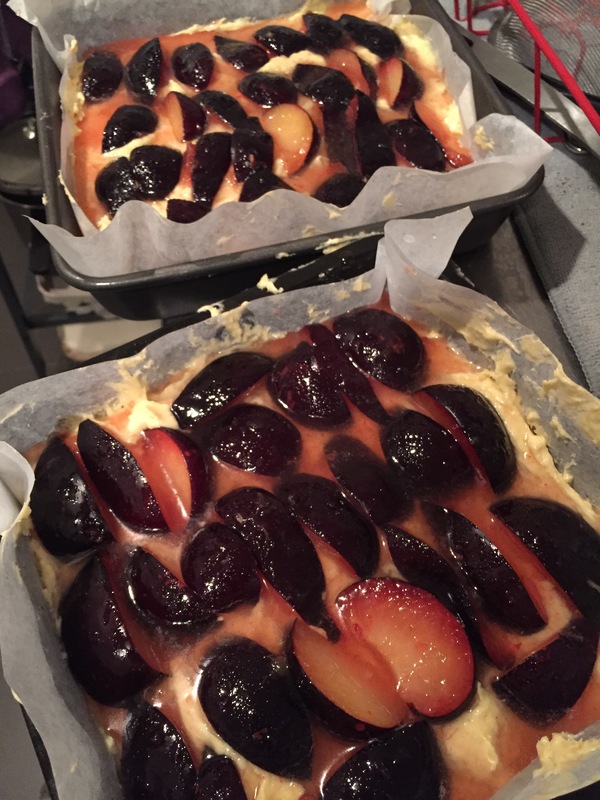 If using tinned plums – drain plums and set aside. I usually use a large Tin of Black Doris plums. Fold in flour and then baking powder. Bake for 30-40 mins until form to touch.